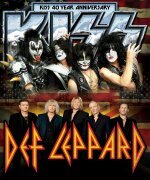 The Def Leppard Summer Tour 2014 with KISS will have a greatest hits only setlist and may be expanded beyond 42 shows. Joe spoke about the tour on 19th March during the Rockline radio show. The initial 42 show run was announced at a press conference on 17th March in Los Angeles. Tickets for the tour went on sale today and Joe say the tour might be expanded. He also commented on the setlist. Listen to all of Rockline via the show page link below. "It could expand, we don't know. Time will tell on that. Initially it's the 42 date tour of the US. One Canadian show, 41 American and this is something that's been percolating for a little while." "When we did VIVA! Hysteria in Vegas it gave us a fantastic opportunity to delve deep. But we can't do that on the KISS tour because both bands are playing headline sets if you like. Both playing an identical amount of time there is so limited time to go deep we'd really have to play the songs the kids are gonna come to wanna see. You can't not play Pour Some Sugar On Me and Photograph and sacrifice those for Rock Brigade and Wasted. It's just not gonna work. That's what Vegas was for and that's what Vegas will be for and other tours in the future but this one is gonna be sharp and to the point."